ExSolar have developed an Energy Monitoring Device which allows you to monitor your usage via our portal. It can be used for either 3 phase or single phase AC systems, and is more accurate than other systems available on the market that typically only estimate the voltage. 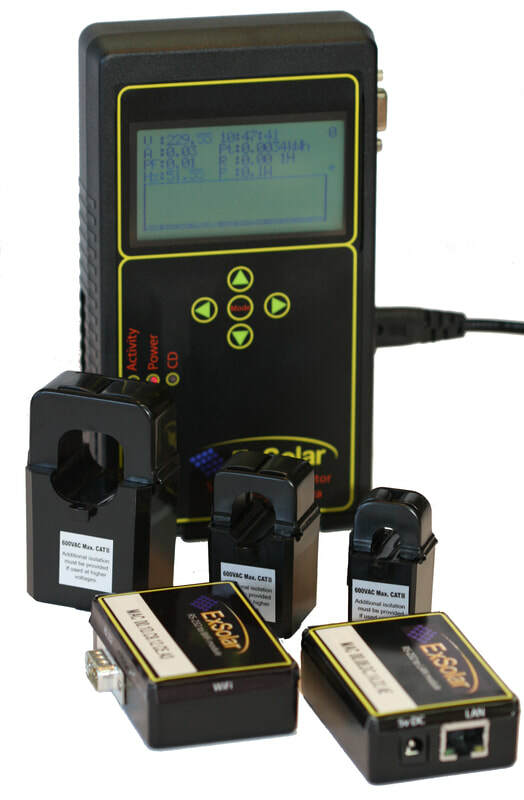 It has 3 AC inputs for various power measurements, and 1 DC input to measure both battery voltage and current – typically used for monitoring battery banks. Also available are a number of network modules for connecting the Grid Tie Limiter/Energy Monitor to our web-based portal: WIFI, Ethernet or GSM. The unit will then log and display per second readings. The unit is designed to measure bi-directionally on both the AC and DC current systems. This device allows Solar systems to be able to “follow the Load” and not over-produce, therefore it prevents pushing energy back to the grid. This feature is especially necessary for installations with Digital or Pre-paid meters (which bill the client when energy is pushed back to Eskom). Only Explorer later than 9.3 will support html5 canvas correctly. Otherwise anything else including ipad, iphone, Firefox, Chrome, safari etc. will work.